Your Canadian source for all things motorcycle! Dakar 2009 - The Canadians are coming! Mike Buehler is a two wheel fan from Portugal Cove, Newfoundland. He's been riding motorcycles for 15 years and pedally bikes for many many more. He earns a living as an Abseiler and can currently be found in the middle of the North Atlantic. If you can find him at home he's usually riding something fun. Dakar! For most motorcycle enthusiasts just the word instills visions of big offroad rally bikes hammering across the desert and dunes of western Africa trailing plumes of dust. The deserts of Africa are full of mystery and romance for most of us who’ve never been there to see the reality of the harsh conditions they can dish out and the beauty that you will not find exactly the same anywhere else. 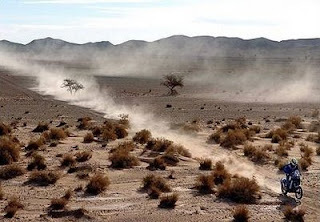 As far as the Dakar is concerned it’s the opportunity for competitors to pit themselves and their machines against some of the most challenging terrain and conditions they are likely to face in any other aspect of their lives. Television coverage of the event always seems to show bikes stuck in sand sinkholes or smashed bikes from an unfortunate trip into the rocks. Sometimes we’ll get to see them wide open across a chott or dry lakebed and fantasize that we could be that person on that bike. Every once in awhile viewers get a glimpse of some of the local cultures the circus trundles through on its mission to the seaside city of Dakar. Long days in the saddle through rugged terrain take their toll; breaking down the the machines and bodies of competitiors over the course of the three weeks it takes to complete. Entry in the Dakar by no means guarantees that you'll get to complete it. Most don't finish at all! The first edition of the Dakar was held in 1979, called the Paris-Dakar because of its start and end cities. Out of 170 competitors, less than half finished the inaugural brainchild of Thierry Sabine. Considering Sabine was French and the route left from Paris it may come as no surprise that a Frenchman, Cyril Neveu, won the first event. Neveu recorded the first victory on a Yamaha. Many years have come and gone since the rally’s inception but the French have continued to dominate the winners podium t aking the top spot in 19 out of 29 years. The rally has been won exclusively by Europeans with no other parts of the world represented as of yet. 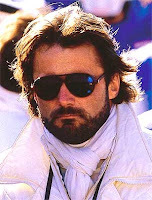 1986 marked a sad mid-point of the history of the Dakar when a tragic event took the life of its founder. Sabine was killed during the Dakar that year when the helicopter he was in crashed in a sudden sand storm. All five on board died in the accident. 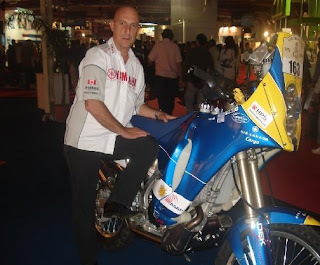 After the loss of Sabine, the Dakar persevered despite many hardships; in 1994 two time winner Hubert Oriol ran the show until he stepped down in 2004. Now the rally is in the hands of Patrick Zaniroli. In the 29 years since the first Dakar there have been few North Americans on the start list, and none that have had the right mix of skill and luck to make it to the finish line first. When you get even more specific there have only been a handful of Canadians to give it a try at all. The first Canadians to attempt the Dakar were defeated by the rally and had to pull out before the finish. It wasn’t until 2001 that Lawrence Hacking made the finishers podium and became the first Canadian to stand upon it. The second Canadian to make it to the finish was Guy Giroux who went for it in 2002 and pulled off a 16th place finish out of 175 motorcycle competitors. Truly impressive! Shawn Price ran the rally in ’03 and was described as an American with a Canadian passport, so I’m not 100% sure to fully count him as a Canadian who has made it to the finish. The next Canadian finisher was Bob Bergman who was bitten by the Dakar dream and got himself there in 2005. He finished what many touted as one of the hardest Dakars in memory. There are many reasons why Bob’s feat is all the more impressive: it was his first attempt, he ran solo as a privateer, he largely paid his own way, and he finished in one of the hardest years. Bob was kind enough to lend me some of his time to informally interview him on the phone to get a little bit of his background and motivation to race the Dakar. He was a roadracer in the 80’s but didn’t have much offroad experience. 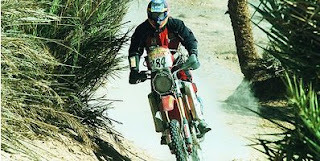 In 2001 Bob started riding in the dirt and when he started racing a few enduros the idea of racing the Dakar blossomed. For three years he followed the event and studied the rules all the while putting together a plan to get himself into the race as a competitor. When race year came around the training regimen ramped up quite a bit to include longer and longer motorcycle rides along with increasingly longer runs to build endurance. With the physical side under control Bob still needed a machine to race on and to take care of all the other myriad of logistics it takes to get to Africa. His first thought was to use a reworked KTM 640 Adventure but came to the conclusion that it wouldn’t be cost effective nor would it end up being exactly what he needed. 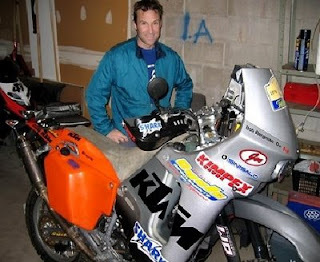 Guy Giroux, yup the same Guy Giroux who finished in 2002, came up with the solution of selling Bob the same KTM 660 Rally that he rode in ’02. It’s really a totally different animal than a regular KTM 640 Adventure, purpose built to excel in the Dakar. Not to mention the extra fuel tanks and electronics such as the roadbook and the event GPS, another difference is the very high seat built to reduce the distance from sitting to standing to help reduce fatigue from switching from one to the other for weeks on end. Decisions like this helped keep the total cost down to a manageable level to the point where Bob didn’t even go looking for any major sponsors besides his shop sponsor: Cycle Improvements. He proved that it is possible to go on a comparative shoestring and succeed; coming from Canada really made him a true underdog compared to the dominant European contingent in the event. Bob wrote an excellent ride report about his experience that can now be found on a dedicated thread on ridetherock that really gives the reader a front row seat to the event. This is a great read and is a shorter viewpoint than Lawrence Hacking’s superb book “To Dakar and Back” that is readily available in major bookstores and at a discount in the CMR bookstore. (It's in the 'Adventure' category) If you think you know what the Dakar is like–think again; after reading these you’ll know it’s even harder than you thought. The landmark 2008 Dakar had two Canadian hopefuls that were putting in their paces to make a bid. Tod Davidson from Ontario was working hard to train while using up his savings and hunting for corporate sponsorship. Everything was coming together including a stellar KTM 525 with the full Rally build when he crashed while sand training in California 3 weeks before the scheduled start. The results of that crash included broken ribs and a punctured lung. Unlucky! By the time he was a week from the race start Tod made the decision not to go despite a thumbs up from his doctor. I guess it didn’t matter anyway as the Race was cancelled in the 12th hour due to the murder of several French tourists in Mauritania. The event organizers were worried that the rally itself would be targeted. Untold millions of dollars and dreams went up in smoke as a result. It was the first time in the history of the event that it had been cancelled, despite previous threats to competitors. Another Canadian looking for his own glory in 2008 was Don Hatton. I made several attempts to contact him through his website to no avail. I was able to get in contact with Don after finding his thread on ADVrider though! It turns out that Don is again on the roster for Dakar ’09, which is great. We now have two Canadians to support and cheer for! Is this a first in the history of the Dakar? Dakar 2009 will make history yet again as it moves from the African Continent to South America where the course will cover every kind of terrain as it wanders through the Argentina and Chile landscapes. 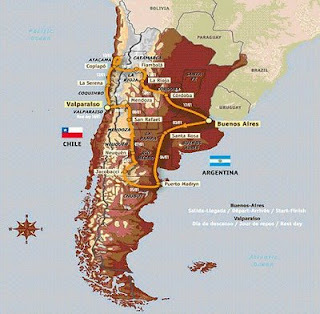 The route is made up of a near 6,000 km round trip to Buenos Aires, via Valparaiso. Starting on January 3rd and finishing up on the 18th, there is only a single rest day scheduled! This year there are 530 teams registered to compete in the event. 230 of those entrants are motorcyclists. The longest day appears to be Stage 10 which falls on Tuesday, January 13. The special stage is 666 km that day! I wonder if that's some kind of joke! I looked into buying a “tourist” seat in a team pickup truck but my meager resources couldn’t make the entry fees for that. Oh well. But all is not lost–a new Canadian contender has surfaced and we now have someone to cheer for! Another Canadian looking to test themselves by attempting the Dakar in 2009 is Pierre Navarro is from Quebec. He'll be racing on a rally modified Yamaha. You should go to his website and order a t-shirt to help out a little bit and show your support for the latest Canadian to make his bid to stand atop the podium at the Dakar finish line and go home with a finisher’s medal. The 2009 Dakar will be airing exclusively on the OLN network in Canada. It will premiere on January 3rd and air weekdays at 4:30 & 7:30 pm and on weekends at 4 & 7 pm. That title sure is a mouthful, but an astute eye may first be drawn to the "With a foreword by Malcolm Smith" on the front cover. Smith was a pioneer in off-road motorcycling and gained fame for his numerous motorcycling accomplishments, including the Baja 1000 and 8 gold medals at the International Six Day Trials. Perhaps his biggest claim to fame though, was being a star 1970s motorcycle movie, "On Any Sunday." The movie helped launch a popularity explosion of off-road motorcycling in America. Written by Carl Adams, a 45 year veteran of motorcycling himself, this book offers a fairly comprehensive education about dual sport motorcycles. If you want to learn about dual sports this 'the' book to have. The book began not as a book at all but a half day training session that was offered to members of the Dust Devils Motorcycle Club of Reno, Nevada. The course wasn't just geared to novices; students were new riders, returning riders, and experienced riders who wanted to improve specific techniques. Over the years the course was improved and tweaked, and a new class on navigation was added. Carl then used the course as a guide to create the book and expanded upon it to make it even more comprehensive. Riding partners of Carl, and other experts all contributed to making this book a fantastic resource and distillation of many thousands of hours of dual sport riding experience. The book is full of pictures, over 250 full-color photographs actually. They help illustrate the many options for gear, clothing, and aftermarket accessories which can greatly add to the safety, comfort, and convenience of any motorcycle adventure. The book also includes plenty of references and sources that will help identify companies that have dual sport experience and a history of reliable performance. 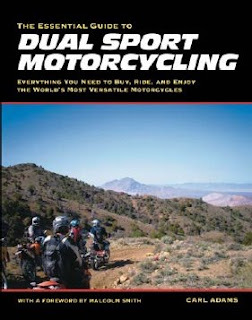 The book itself is broken into sections; section one provides lots of information on how to choose a dual sport motorcycle and conveys the versatility and fun of dual sport motorcycling. This section will be of particular interest to those who are new to the sport or are considering getting into it. Even if you're an experienced rider this section might offer some insights that you hadn't considered, or might act as a good reminder for you. Section 2 focuses on riding gear and motorcycle setup. The book includes detailed information on what gear is suitable, and why you use it. Practical information on choosing tires, and very detailed information on suspension and how to get the best from the motorcycle and have it react perfectly for you. New riders may find some of the information in this chapter a little heavy and technical. The suspension settings section in particular. It's well written - it's just pretty tough to make suspension setting sound really exciting. It's a necessary activity though and this will certainly help riders dial in the perfect settings for their machine. Section 3 gets into riding, maintenance, and trailside repair. You'll get some of the basic safety tips, basic and advanced riding techniques, and how to do some typically necessary trail side repairs. Very helpful stuff here. Section 4 covers "increasing your enjoyment" and reviews different types of organized activities, exploration, and various types of dual sport touring that are available. 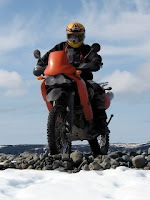 Some off-highway navigation techniques and touring is discussed as well. I definitely learned a lot about dual sport motorcycles by reading this book. The first part was a quick read because I was already familiar with the basics. Some of my knowledge would have come much quicker if this book had been around a few years ago though. My eyes were opened to the complexity of suspension tuning and the possibilities for improving and customizing ride characteristics. If you want a shortcut to being an educated and better rider, then this book will definitely appeal to you. Want to learn more about the sport of dual sport riding? - then this book is for you. Are you an experienced rider who thinks they couldn't possibly benefit from reading this book? - this book definitely has some sections in it for you as well. Carl packs 45 years of riding experience. You can ALWAYS get a little better. Just because you've been riding a long time doesn't mean that you're doing it the best possible way! It's a good read and very informative. I'm happy it'll have a home on my bookshelf. Some of the technical parts (particularly the suspension setup) and riding skill elements are sections I'll refer back to periodically so it'll be nice to have as a reference. The book makes you want to get out and ride and practice some skills! The Essential Guide to Dual Sport Motorcycling is available via Whitehorse Press or you can purchase it at a discount from the recommended retail price of $24.95 US through the Canadian Motorcycle Rider Book Store. 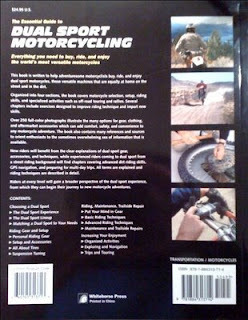 Just search for "The Essential Guide to Dual Sport Motorcycling" or click the link below. © 2007 - 2014 CanadianMotorcycleRider Productions Contact Us!